First and foremost, resist making a big, new purchase, like a new car or home. While these items may have been affordable before, you will likely find that they are cumbersome when you have a slew of new bills to cover on your own, as a single person, once the divorce process is finalized. Also be careful about cashing in on seemingly large piles of money sitting in accounts somewhere, such as investments or 401(k)s. Keep in mind that cashing in on these can not only result in substantial, unforeseen tax consequences, but if you withdraw from your 401(k) before age 59 ½, you will also pay a penalty to the IRS. Another problem with this track is that it will likely take you off the financial path that you and your attorney planned out for you, which is somewhat dangerous. When it comes to planning for post-divorce, sticking to a financial plan is extremely important. Keep in mind that, if you received a portion of your ex’s retirement accounts via a qualified domestic relations order (QDRO), you can open up a new IRA in your own name, and continue to defer paying taxes on that money. As you may have heard, as of all divorces finalized after December 31, 2018, the tax benefits of making alimony payments disappear. 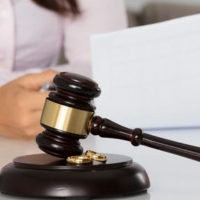 Believe it or not, this makes some people want to just quit their job in an effort to avoid paying alimony altogether, but this is not a good idea in terms of your financial stability, and it could also land you in court. Finally, one of the biggest mistakes we sometimes see clients tempted to make is fighting for the family home at all costs. While the family home may seem like your biggest asset, keep in mind that it may also be too much in terms of the mortgage and maintenance for one person to keep up with. In addition, you may end up in what’s known as a negative equity situation, whereby the house is now worth less than what you owe on it. Keeping the family home may very well be the right decision for you; just make sure that any big decision like this that you make is well-vetted with your attorney so that it is part of a wise financial plan. If you have any questions about financial decisions and divorce, contact our Florida divorce attorneys at Trachman & Ballot-Lena, P.A. today. We serve clients in David, Fort Lauderdale, and surrounding areas.